This is by far the best book on French domestic wiring that exists for DIY readers. It covers all aspects of wiring and the parts of the other trades that go along with it. It has detailed wiring diagrams of all the circuits that you might use in your home including lighting, sockets, heating and so on. It is written in a way that assumes little or no previous experience of electrics and is very visual, with diagrams and illustrations throughout. This third edition covers the latest code changes and for most installations this books has everything that you need. It is weak in two areas. Firstly, it covers solar PV and micro generation but not in any real depth, but this is best left for another volume anyway. Secondly, the installation of the tableau electrique or consumer box, is not that clear in places. Perhaps this is due, in part, to the fact that this is covered in another book by these authors on this subject. Last week the Eyrolles publishing company announced the revised fourth edition of L'installation électrique comme un pro, including all the latest amendements to the French electrical code. This is the table of contents. Page count has been going up: 338 pages in the 2nd edition, 358 pages in the 3rd edition, and now 478 pages in this 4th edition. New cover, even more content than in the previous editions. Special attention for new technologies in the domestic environment: domotics, the special tableau de communication and associated network cabling, renewable energies as solar panels, windmills and micro hydro power. Price has gone up from 25 euros to 35 euros, but for such a complete reference book, even for French professionals, this is still a bargain. The complete French electrical code NFC 15-100 goes for 321 € HT, and reading it is quite a challenge, let alone understanding the technical semi-legal language. Thanks to the many pictures, their narrative way of explaining and their knowledge of the practical side of the French regulations Thierry and David have been able to reach out to a vast audience, and will continue to do so with their latest update. Trying to figure out if the Eyrolles publishing company already mentions something about a fifth edition, incorporating the changes of the so called "Amendement 5" of the French electrical code, I found this document hiding somewhere deep down in their website. Only seven pages, a summary of the most important changes, to be used as an addendum. Dear DIY and pro, print it and put it into the back of your copy. Will there be a fifth edition real soon? Gazing into my crystal ball: even the Promotelec organisation, announcing their new "Officiel de l'Électricité" offers their dear clients the possibility to order it already, but they start printing not earlier than June this year. Why? They don't exclude the possibility that there will be additional changes in the regs. Only one little footnote: " * sous réserve de parution de textes réglementaires en attente". My interpretation: the battle in Paris about the communication network, will it be in or outside the scope of these regs aiming primarily at electrical safety issues, is still ongoing. Back to the announcements by the French government two years ago about the simplification of many regs in the construction sector: the public at large got the impression that in the near future this communication network obligation would be dumped. Crystal ball continued: everybody tries to get rid of their old stock and watches the end level of this game set in Paris, two bosses this time, called Safety and Communication. Who will win? Finally available: the fifth edition of "l'Installation électrique". To keep you informed about possible Christmas gifts: the curtain now has really fallen on the 28th edition of “Locaux d’habitation”. For sale from april this year until October. Used to be such a nice booklet. And nothing left in stock Promotelec told me. The updated content you’ll find in “L’Officiel de l’électricité“, the 172 pages of chapter 3 “Installations électriques des parties privatives”. 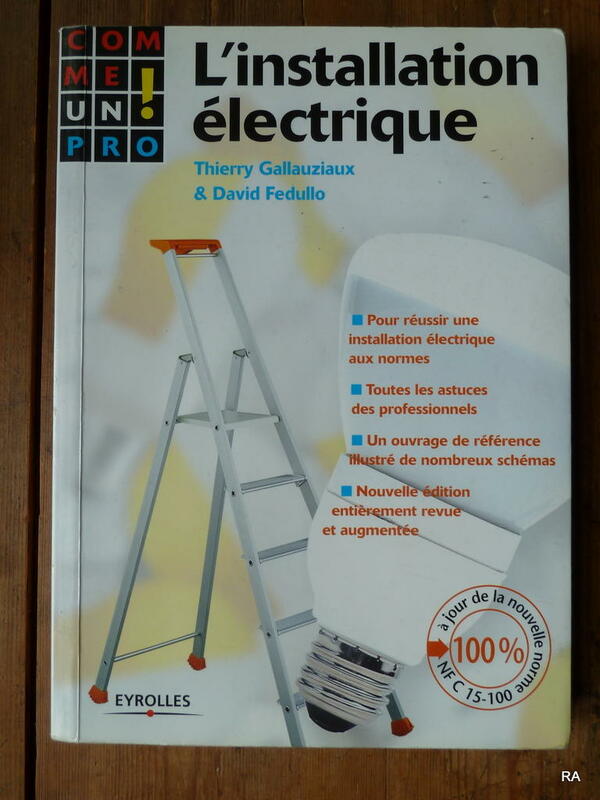 In this book almost everything an electrician needs to know about the French regs. The 500 pages are probably a bit of an overkill for the DIY, see this summary. Many helpful illustrations. And the winner is? The network lobby, the obligation to install a communication network with ethernet cables and a special coffret de communication is still there. No simplification at all, des promesses non tenues. What's new. 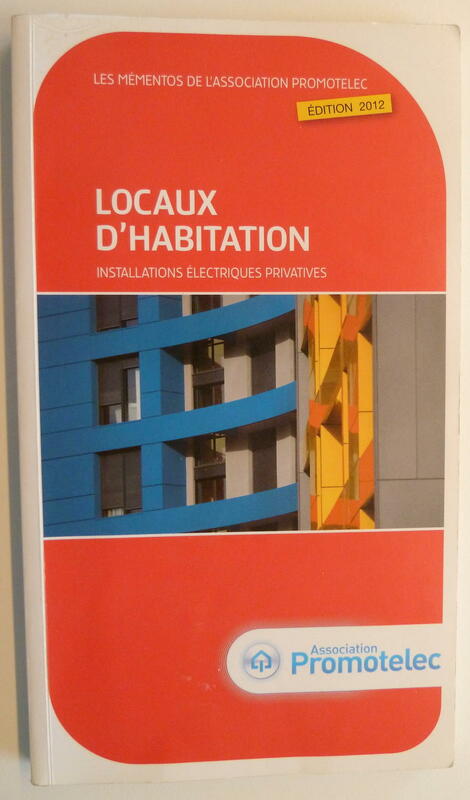 Almost a year ago both authors published a slightly revised 6th edition of "L'Installation électrique". Page count of the 5th edition of L'Installation Électrique (October 2016, including all the Amendement 5 changes) was 580 and 8 pages more in this 6th edition. No reason to buy the new one if you already have number 5. If you want to be informed about (minor) updates of the regs visiting Promotelec's website helps. About charging electric vehicles and this about possible smart meter problems. Or visit their revamped FAQ corner.